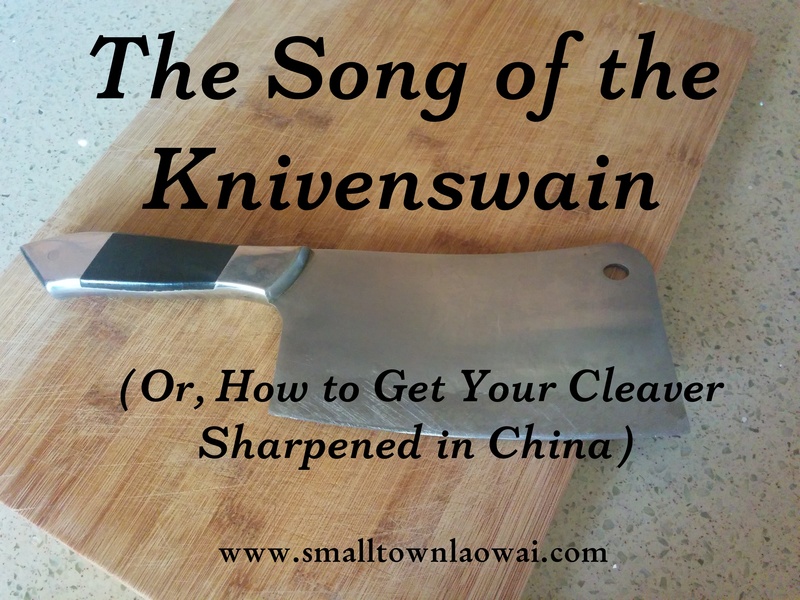 Getting your cleaver sharpened in China is well worth the price of admission. It’s not expensive, but it’s quite a show. Especially when law enforcement gets involved. 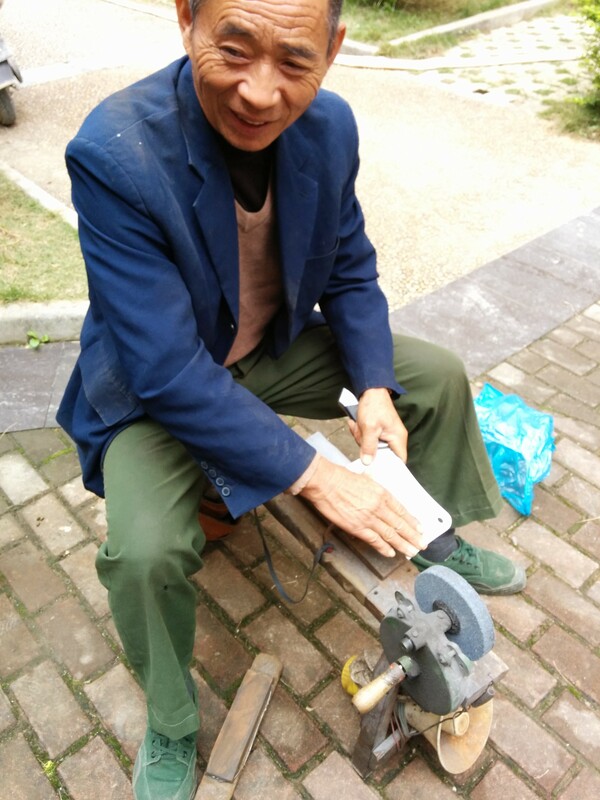 Want to get your cleaver sharpened by a professional in China? Here’s what ya do. You have to wait, sometimes weeks or months, for the traveling knife sharpening guy to come through your neighborhood. Usually they arrive with their whetstone wheel on the back of a cart or bicycle and set up shop right in the middle of a sidewalk. A hand-powered whetstone on a metal and wood stand. The plastic bottle holds the water (yes, water, not oil) and the bullhorn is for advertising. The shoes are for awesome. This is basically how I imagine they used to sharpen swords back in the days of knights and dragons. Minus the plastic bottle, bullhorn, and shoes, of course. So, I think the guy should have some cool medieval name for his occupation, am I right? Like lorimer (maker of horse gear), oynter (oil merchant), hetheleder (seller of heather as fuel), or chandler (no one can ever quite remember what that guy’s job was). Anyway, once this guy gets into your neighborhood, he will sing out a short but very loud song, sometimes with the aid of the afore-mentioned bullhorn. (Remember that “very loud” part because it becomes important later in this story.) Someone help me out if I’m wrong, but I think he sings “lái mó dāo!” which means, “come sharpen knives!” And, seriously? Is it not even more medieval that he sings a song to announce his presence? “Hot Cross Buns” and all that. Okay, so, as soon as you hear the song, you grab whatever cutlery you need sharpened and out ye get, ye good people of Notthingham. So, that’s what happened one day when we were in our small town. I heard the call of the wandering whetstondle*, grabbed our dull cleaver and rushed out, as fast as one can rush when one is carrying substantial cutlery. I hoped I hadn’t missed him. These guys move on quickly if they don’t see customers coming out right away. Thankfully, he was down a few buildings just setting up his wheel. Whew! Now, what follows is a major Life in China Hint: the best way to figure out a fair price is to eavesdrop on what the vendor tells a local person. Second best option is for them to tell you the price in front of a local person. He considered my cleaver for a moment, then said it would be 10 kuai. The neighbor nodded. “Okay, I’ll be right back,” she said, then went upstairs to get her knives. I figured that was a good sign—she didn’t argue or balk at that price. So, I agreed to 10 kuai for my cleaver without even trying to bargain. I’m lousy at bargaining. The guy set to work. It’s pretty awesome to watch them do this. Round and round the wheel goes, and the guy just seems to know what angle to hold the knife at, when to add water, all that. I mean, I guess he should since it’s his livelihood and all, but I’m also lousy at sharpening knives, so this is impressive to me. So, while the knivenswain* is doing his thing, I realize how cool it would be to record the song he does. You know, for posterity. For when all of China is finally swallowed up in modernization and McDonald’s, and guys like this don’t exist anymore. So, I ask him if he’d be willing to be recorded. “You want to record me? Sure, go ahead and record whatever you want.” He’s laughing as he says this. He’s thoroughly amused that this crazy laowai wants to record something as mundane as his song. I call my husband (on my phone, not shouting up as would be more culturally appropriate) and see if he can get his recording equipment ready. 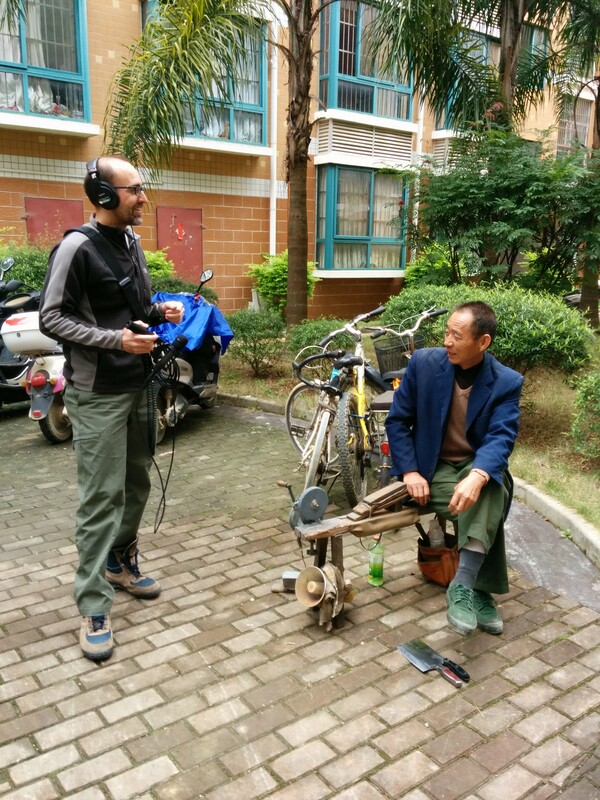 He’s got some pretty cool stuff for field recording. He agrees, but the guy is basically finished with my cleaver. As we’re exchanging cleaver and payment, the neighbor lady arrives with her fruit knife and small vegetable knife. I decide to go drop off the cleaver and help my husband with his equipment, so I start up to our apartment. While we’re inside our place, I realize something bad is starting to happen down near the whetstone. I can hear loud arguing that is getting more and more heated. I peer down from our window to survey the situation. There’s the sharpesdier* along with Neighbor Lady #1, who’s waiting for her knives and some other neighbor plus assorted kids. 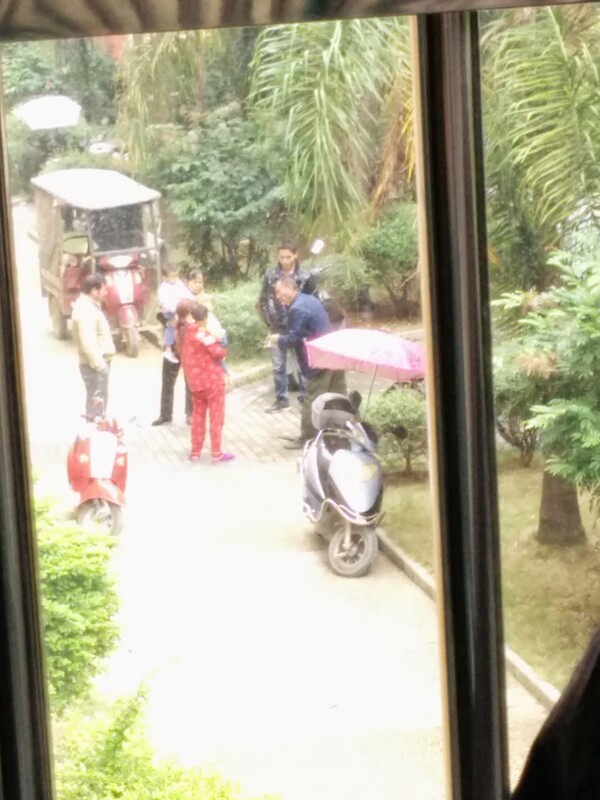 But now they’ve been joined by two of our apartment complex’s guards who are gesturing angrily. Uh oh. I don’t think the grinderman* is going to be down there for much longer. We scramble ourselves and the recording equipment out the door, and as they see us arrive, the argument suddenly cools off. Interesting. We’re not sure what to do but since things look stable, my husband starts to set stuff up. Just as he has pointed the microphone at the knifenary* and asked him to begin singing, one of the guards half-mumbles a protest. He explains that the whetman’s* song is so loud that it has disturbed the peace, plus they don’t allow merchants to set up shop inside the apartment complex. We gather that the guards were just about to throw him out when we walked into the scene. The guards reluctantly agree to this plan, and even look amused for some of the photos. We sheepishly get the recording, then scoot out of there as quickly as we can. The cutleriant* does the same, probably happy to have foreigners to shield him from the guards because it meant he was allowed to finish our neighbor’s knives before getting evicted. That was three years ago, and when I finally got around to getting the recording transferred, we discovered that the storage device had gone kaput. No!!! So much for all that awkwardness and effort to record the guy. In those three years, I have never seen a wandering grinder again. Perhaps China’s rapid development really has swallowed him and all his buddies up. If one happens to come to where you are, record the song, would ya? Posterity and I will thank you for it. *I don’t think any of these is going to become the cool new title for this poor grinder, but it was fun to try. Let me know which one you liked best! Get Small Town Laowai posts sent right to you so you never have to miss any of the crazy. Oh, ouch! Amid my laughing, because yes, I can imagine ALL of this confusionarianism and local powergrabberdom in the Middle Kingdom, I do like the knivenswain best. Reminds me of Chaucer, and we must needs pay homage to the muttlianish multiplicated roots of our beloved English language. I do believe Gilbert and Sullivan could have made a delightful operetta out of all of this: I am the very model of a modern tradesman-driver-outer, or something of the sort. Thanks and bountiful benediction for the laughter and cheek-tongue filler. Ha! There are lots of directions one could go with this material, I suppose! Awesome post, but too bad about the recording. 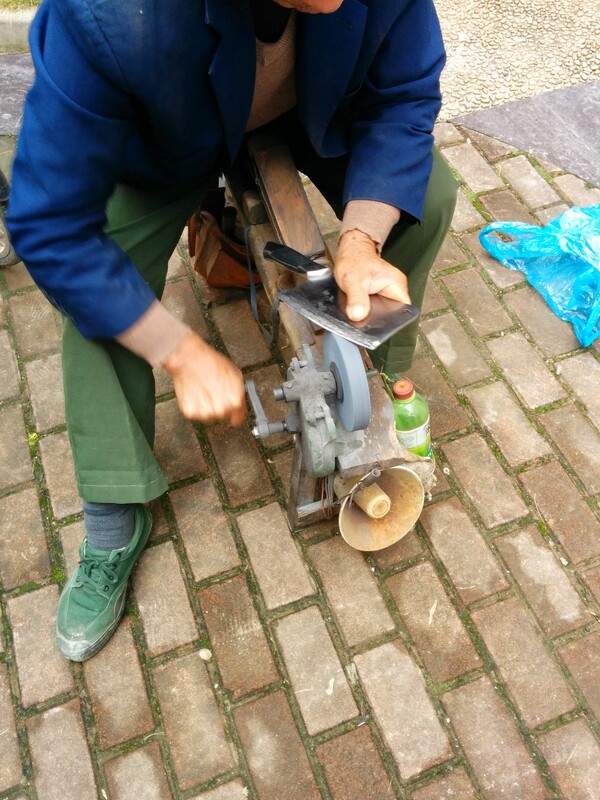 In Yanjiao (Hebei, east of Beijing), and also in Beijing it seemed to me the sharpeners usually had a string of blades they would jangle which made a really annoying sound but also unique and it cut through any street noise. There usually was also a “song,” but that was secondary and scarcely audible by comparison. Jangling blades?! I think that beats a song. You didn’t happen to get video of that, did you? Are they still around? If I ever find myself in Hebei, I’ll have to look for those blade-jangling grinders. Thanks, Charles! Emily: Full disclosure: I actually have not even seen what makes the sound, and so I’m speculating when I say “a string of jangling blades”; anyway, that’s what it sounds like. So no, I have no video, but I’ll be happy to make one next time I get an opportunity. Pretty sure I have heard them on the Tsinghua U campus among other places. Ha ha, no worries. Let me know if you ever catch one in action! Love your blogs. My husband and I travel to China once a year and visit our folk in various places. Our last trip was for three month. Mi love reading your blogs as I can identify with most of them but more than that, you take us back to China with very fond memories of each trip. Your blogs are great! Keep them coming! We love all your photos, your sense of humor and we give us a sense of being there with you! Thank you! Bless you! I love everything about this post – your lack of bargaining skills (I have zero, as well), the photo of your husband with him, the fact that you were brave enough to ask to record (I’m so bummed it’s lost – I wanted to find out if it sounded like ours), and knivenswain. I think that has to be my favorite. I’m sure that man has not forgotten you, either. Our guy just returned last week after a 6 month absence at least. But I’ve never been brave enough to go out there. Next time I will. Yes, definitely go out there! You can have a cultural experience and a really sharp cleaver! I am also really bummed about the lost recording. I can still hear the guy in my head, so at least there’s that. Knife sharpening without a song? You are getting ripped off! 😉 I suppose he doesn’t need an advertising jingle if everyone knows where to find him when he comes around. Your well-told story reminded me of a similar experience of timeless Chinese street sales & marketing. I lived in China in 2007-08 while working on the Olympic Torch Relay for Volkswagen Group China. As the only foreigner on our activation team I got to experience more than half of the provinces, SEZs, and SARs in China as we followed the torch. It was fascinating for sure but could also be quite lonely and unsettling sometimes. I was an itinerant wanderer of the streets of whatever province I found myself in when not working. And while China can sometimes feel hallucinatory, I would often hear what sounded like someone sing-song calling my name through the cacophony of the early morning city chaos…Miiiii-chael! Miiiii-chael! Was I finally a casualty of the laowai meat grinder that Mainland China can be?!? As my mandarin improved–slightly–I soon realized it was actually the seller of the cornerstone of my cheap Chinese hotel breakfast buffets: Maaaaan-TOU! Maaaaan-Tou! Ahhhh…the steamed bun man! Mmmmmm…mantou. 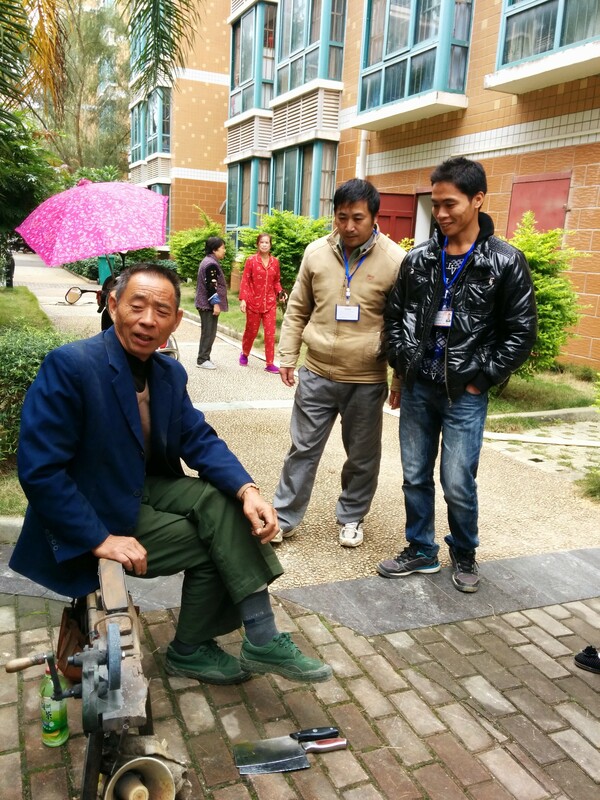 Thank you very much for your evocative posts of life in China. They bring back a lot of memories. And I think ‘knivenswain’ should be a thing. Can we make it a thing? 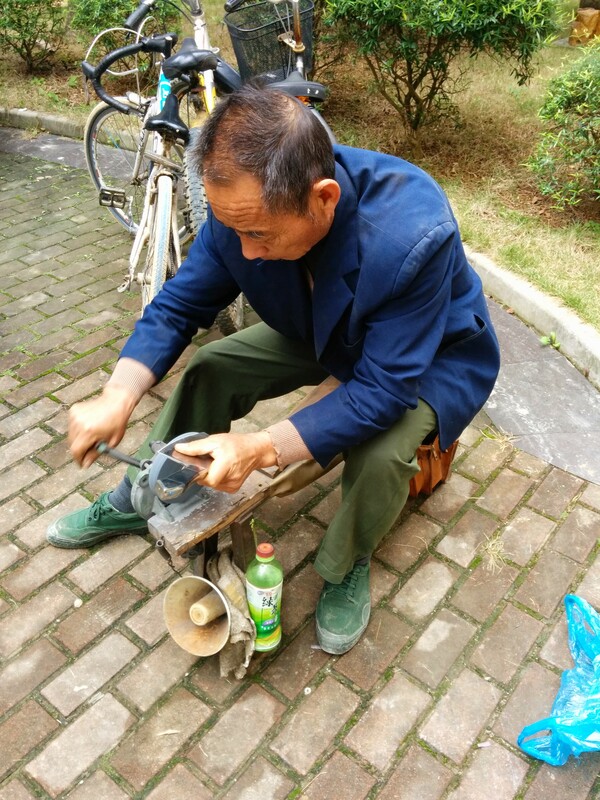 Now I miss the travelling knife sharpening folk of China as well. I was grateful to find a knivenswain at a local farmer’s market when I moved back, to sharpen my precious caidao, and after moving away from that town I even brought my knife back on a road trip to have it re-sharpened, because a dull caidao is a dangerous (and annoying) thing! What a very precious memory, Lily! The roasted sweet potato vendors always make me smile anyway because the sweet potatoes are sooo good, but you have very good reason to feel heartwarmed when you see them. There are several Chinese kitchen items I can’t imagine living without, and a good caidao is one of them! I don’t blame you for carting it along to get it sharpened. Ah-ha!! Thank you so much! You rock.